Some stories just don’t need sequels. Imagine watching Humphrey Bogart bid his heartbreakingly romantic farewell to Ingrid Bergman on the tarmac at the end of Casablanca, only to follow him to a bar afterwards to hear him whine pathetically for hours on end about second-guessing his sacrifice and beating himself up over making the worst mistake of his life. Well, that would rob all the magic out of a classic ending, wouldn’t it? This, in a nutshell, was pretty much how I felt about The Monster Baru Cormorant. Keep in mind that its predecessor, The Traitor Baru Cormorant, was one of my favorite books in the year I read it, and it had one of the most tragic yet exquisitely poignant and tear-jerkingly beautiful endings I’ve ever read. And then this book had to go and ruin it all for me. But first, lest it needs to be stated explicitly, stop reading this review NOW if you have not read the first book. There WILL be spoilers for it, especially the ending, which I will be talking about, A LOT. 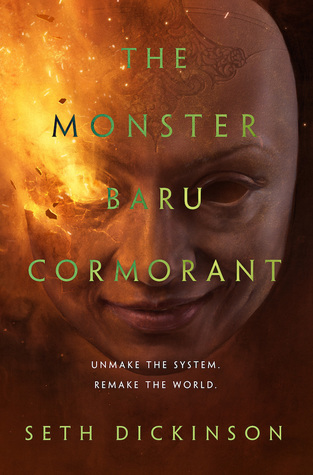 Monster picks up almost immediately after Traitor, at the end of which I was left speechless when imperial accountant Baru Cormorant watched the Masquerade execute the love of her life—an execution order she herself had signed. But having glimpsed into the inner workings of Baru’s mind, I knew why she had done it. Every action, every decision was carefully measured and balanced, with an eye towards final results. Even Tain Hu, the rebel duchess who came into our protagonist’s life and thawed her cold, calculating heart had, in her final moments, reconciled herself to the fact that things had to play out the way they did. It was, after all, what made the ending of the first book so incredibly damned special. Mind you, I was completely gutted, but I understood. Which, unfortunately, is more than I could say for this sequel. The steady and purposeful Baru I knew had been replaced with an insipid, wishy-washy milksop wallowing in her self-pity. The irony, of course, is that I would have given anything to see more of this softer side of our protagonist in the first book, but as they say, be careful what you wish for, because this was nothing like what I had in mind. While I certainly did not begrudge Baru for her regrets over Tain Hu, I did become angrier at her the more she dwelled on her part in the execution. Well, that was what you wanted, wasn’t it? Least you can do is own it, damn you. So, needless to say, this book and I got off to a rough start. But things did not get better. The series seems to have lost its direction, or has simply gotten too big for itself, because now it just feels like we’re doing things for the sake of doing them. At times, some of the things that came out of the Baru’s mouth were so random and outlandish, I did wonder if they were thrown in just for the shock factor. Diversity also seemed forced, included not because it actually mattered, but compulsory-like, as if the author felt that it was expected of him. The story itself was contrived, not to mention the sheer amount of bloat in the plot which was all over the place. Quite honestly, given how all the pieces came together so perfectly at the end of the first book, the absolute confusion and lack of direction in this sequel came as quite the shock. Bottom line? I can’t believe what I’m about to say but here it goes: I wish I never read this book. I wish I had kept my memories of The Traitor Baru Cormorant intact, untarnished by the knowledge of everything that came after. And this is coming from someone who wept tears of pure emotion at the end of the first book. Really, the only saving grace of this sequel is Seth Dickinson’s gorgeous writing, which is as irresistibly lush and beguiling as I remember it. Despite my disastrous time with The Monster Baru Cormorant, I will still definitely seek out more from him should he start on any new projects, but no more from this series. This book broke my heart all over again but this time for very different reasons, and I just don’t know if I can take any more. Right? I think if you’re gonna go for that bittersweet ending, you go all the way and leave it at that. OH NO, I’m so sorry this was such a rough read! I personally loved it but I definitely agree with you on Baru being a weaker version of Book 1 Baru. I’m hoping the later books will give her some better development. And it kinda feels like Traitor was its own separate book, and then Monster is like the start of a new trilogy set in the same universe. I’m glad you loved it! I know there are plenty of people who really enjoyed it and I on some level I can understand why since it takes on a more adventurous tone, and it opens a whole new chapter for Baru. My condolences. I’m very sorry for your loss and I’m sure that Book 1 is at peace in Book Heaven, looking down upon you. Dang, in all seriousness, that really does stink. I’m happy that it didn’t turn you off of the author though and hope his next offering, in another series, can still work for you. Haha, Book Heaven, so far not a lot of books have gone there, but the first book of this series certainly belongs there now. As a book lover, I can’t say I’ve regretted reading many books, even when they sucked, but this one…yeah. This is the saddest review I’ve ever read😥 I hope you can read a palette cleanser and maybe forget about it? So, would you say you had feelings about this book? 😉 . Sorry you had such a negative experience. I’ve read Traitor but hadn’t gotten to this one yet. I strangely didn’t get all the Feels from Traitor (I think Baru’s own clinical calculation distanced me a bit) so I’m curious how I’ll feel if/when I read the sequel. An honest review. Some stories, books, and movies, just don’t need a sequel. They are perfect as are. Ah this review makes me realize that I do not want to read book 2. I will leave book 1 the way it is in me noggin. Excellent review matey. Sorry that book two didn’t work so well. Nah. It can be a standalone in me noggin. I be cool with that. Arrr! So…I stopped at your spoiler warning because your description of The Traitor Baru Cormorant ending makes me want to read it.